Reflexology Course, Time to start on a New Career. Taking a Reflexology Course can open up before you a whole new path to the natural healing arts. Would you like to earn your own money? Say goodbye to your day job. Yes I did say you can say goodbye to that day JOB! This is the course for you. 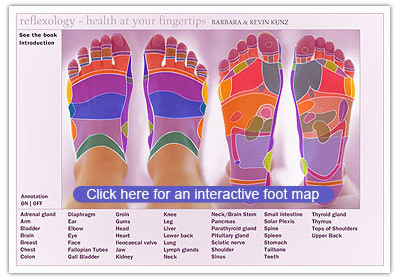 Reflexology, like massage is a non-invasive therapy of the soft tissue of the body. By stimulating the reflexes of the feet with pressure massage the organs of the body then become stimulated. This then allows the body to unblock these points and begin the healing process. When you stimulate these reflexes our body will also start the detoxing process. Anyone can learn, so start and see the possibilities open up before you. What this course will give you. You will gain the skills needed to develop strong practical experience. It will help you develop the confidence that you can assess your clients needs. It will help you gain more knowledge of how the human body works. You will see just how wonderful the healing power of the body is. As a reflexologist you will be able to find employment. In clinics, or the massage or spas industries. Think also about opening your own home based business. The Bureau of Labor tells us there is room for many more reflexologist. With the greater acceptance of natural healing the career opportunities ahead, are open to you.